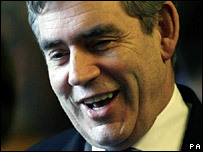 UK Prime Minister Gordon Brown has announced a new internet project to vastly expand the teaching of English. A teach-yourself-English site will also allow people worldwide to make use of a form of one-to-one tuition using internet telephony systems. Mr Brown said it would be aimed first at China and initial hopes were for it to get one million hits a week. He also announced plans to recruit "master trainers" in India to train up 750,000 English teachers in five years. Announcing the initiative, Mr Brown said no-one "however poor, however distant" should be denied the chance to learn English and his aim was for at least one billion more people worldwide to have access to teaching materials within ten years. He said the British Council would set up the new website, which would offer one-to-one tuition through VOIP (Voice Over Internet Protocol) - which allows people to make free phone calls over the internet. He said he hoped it would be used by people in "schools, cities and even remote places on every continent". Outlining his plans for China, he said he hoped the website would support the Chinese government's decision that English should be taught in all schools from age six. He also said the numbers of English teachers needed to be boosted - and more distance-learning courses would be developed to achieve that, as well as encouraging broadcasters like the BBC to make more English curriculum programmes available on the internet. And the British Council will spearhead a drive to recruit "master trainers" in India, with the aim of training up 750,000 teachers in five years to work with public and private bodies to improve English for millions of Indians. Mr Brown also hopes to persuade more telephone, telecom and other broadcasters to make more English lessons available through various channels. "With more teachers, with more courses, more websites and now a deal involving the publishing media and communications industries, we will open up English to new countries and new generations," he said. He said he hoped to make English the "world's common language of choice".